Those who have not followed the Mario Party series in recent years could be forgiven for dismissing its 9th console entry as yet another attempt to milk an aging franchise. Hell, even as someone who's been mini-gaming around the Mushroom Kingdom since it required being tethered to an N64, I had trouble mustering enthusiasm for the latest sequel. Allowing that big "9" on the box to mislead you, however, would be a mistake on the level of hiring Bowser as a babysitter. You see, Mario Party 9 -- the series' first entry in nearly five years -- feels surprisingly more like a thoughtful reboot than a phoned-in rehash. While not tinkering too much with its familiar board-game formula, developer Nd Cube -- housing many of the team at long-time Mario Party planner Hudson -- has added a few seemingly simple, but ultimately significant tweaks to the franchise's core concept. Boss battles, a first for the series, are chief among these welcome changes. Dice rolls, score-ratcheting collectibles (mini-stars, in this case), board navigation, and frantic competition with up to three friends are still the name of the game, but now this well-worn blueprint is broken up by encounters with Bowser's minions. Tangoing with the Mushroom Kingdom's meanest not only adds some goal-oriented structure -- and even a bit of story -- to the otherwise random action, it also brings Mario's posse together like never before. Unlike the cutthroat nature of most of the 80 mini-games, boss fights force players to simultaneously work together and sabotage each other. When teaming up to battle enemies such as a vicious Chain Chomp or cloud-riding Lakitu, each competitor must also play dirty if they plan on netting the most mini-stars. This can mean delivering the most devastating attacks to a big bad or simply beating your buddies to the final, bonus-granting blow. On more than one occasion, this passive-aggressive dynamic had me recalling New Super Mario Bros.' addictive mix of co-op and competitive action. While getting to duke it out with the likes of King Boo will no doubt steal the biggest back-of-the-box bullet point, a more modest ingredient does just as much to improve the Mario Party recipe. Rather than each participant navigating the board separately, as in previous entries, all competitors now share a single vehicle that follows the same path. Players still get their own dice rolls and take individual turns, putting them in the role of "Captain," but now everyone's along for the ride. This creates an entertaining dynamic, especially when you've got three back-seat drivers tied to your every move -- expect the whole couch to rumble in revolt when your poor dice roll robs everyone of stars. Being Captain comes with its share of perks, such as dibs on board-sitting stars and veto power over which mini-games to play, but rewards are mirrored with risks. If you're at the wheel when lava starts flowing in the volcano stage, for example, plan on kissing half your loot goodbye. Aside from putting a new spin on a stale concept, this refinement streamlines both the game's pacing and presentation; because everyone's involved in the action regardless of whose at the helm, there's no more between-turn tedium. Watching a camera clumsily zip around the board as it follows each players' turn is also a thing of the past. Other than boss battles, Mario Party 9's challenges aren't especially memorable when judged individually. Still, while you wouldn't want to bowl for Koopa shells, stomp on tiles, or play Mario-themed variations of tag and musical chairs repeatedly, they work well when woven into a 30 or so minute session. They also generally strike the right balance between pick-up-and-play accessibility and thumb-blistering challenge. It also doesn't hurt that most mini-game controls favor intuitive NES gamepad-like inputs over arm-flailing Wii Remote frustration. 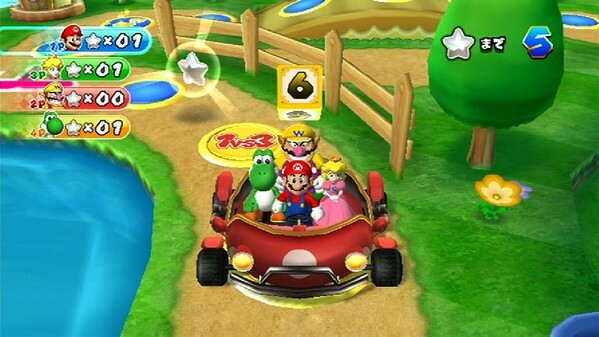 Mario Party 9 is still a Mario-themed board game brimming with chaotic, quick-play challenges starring Nintendo's iconic cast of characters. And even with its welcome tweaks, winning is still too dependent on randomness and luck. If you weren't a fan before, this one won't see you abandoning Modern Warfare 3's front lines to get your mini-game fix. Seasoned Party-goers and newcomers looking for an entry point into the prolific franchise, however, should consider crashing Mario's latest shindig. This review is based on a retail copy of Mario Party 9, provided by Nintendo. A full-time freelance journalist, Matt Cabral has been covering film, television and videogames for seven-plus years for a variety of online outlets and print publications, such as Entertainment Weekly and G4tv.com. He's also spent so much time surviving the zombie apocalypse in the virtual world he believes he's prepared for the real thing. You can follow him on Twitter @gamegoat, find him on Facebook, or look for him in the basement of an abandoned building-he'll be the one hoarding the canned goods, med-kits and shotgun shells.